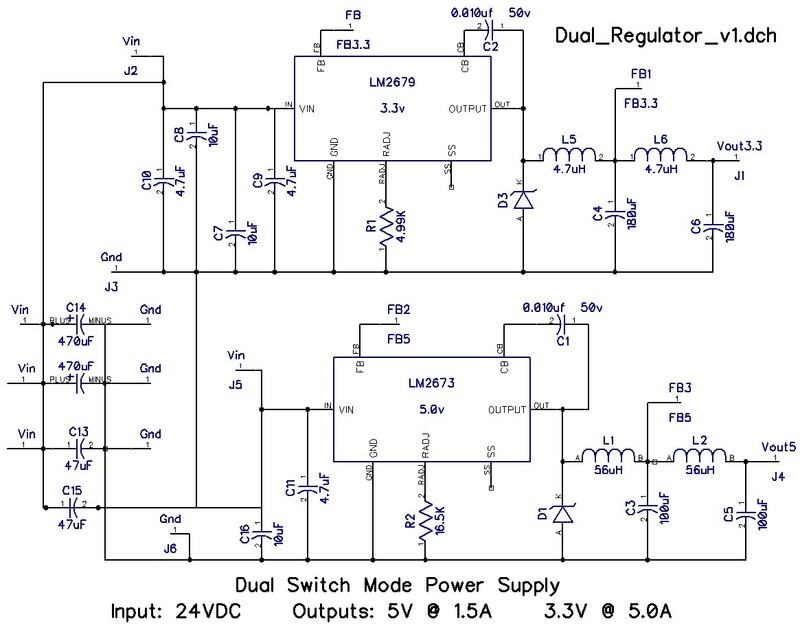 This is a dual output 5V and 3.3V power supply, that operates from a 12 – 24VDC input. The intended use is for powering a special networking switch from a batterybacked supply. The device will need to operate in amient outdoor temperatures in the the central plains. 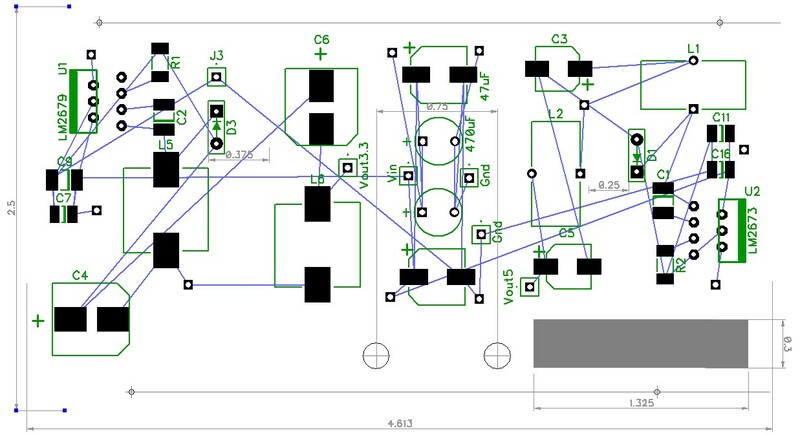 Design is based upon the LM2673 5 volt and LM22679 3.3 Volt SMPS chips. These simplify the circuit and cut the number of external components required. The circuit is very sensitive to layout. You can breadboard this, and it might run, but the output will be very noisy and may not deliver much current. This really does need careful layout on the PC board, with care to keep the boost capacitor close to the chip, and the diode close to the inductor. 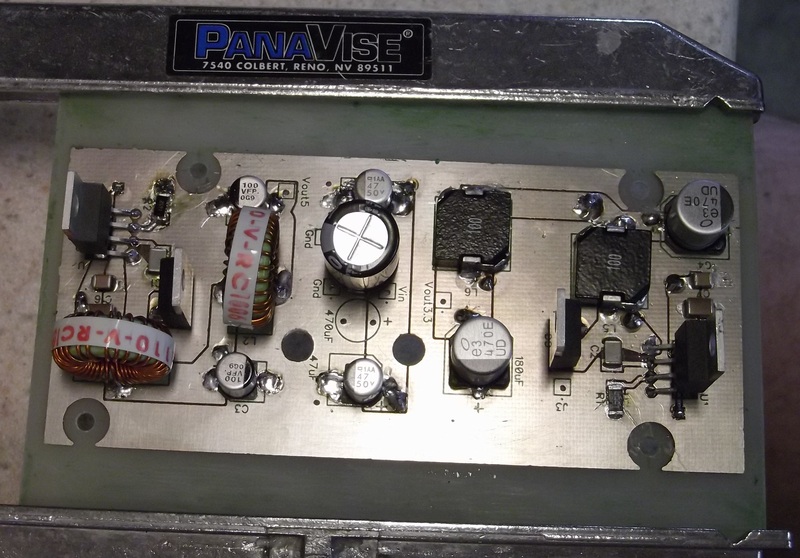 In the initial build, the 3.3V output has high noise (50mV p-p) and poor efficiency. Redesigned the layout and changed to a better diode: MBR745 from Vishay. The new layout only has 30mV peak-to-peak noise. Shown here with out the copper pours, etc. The ICs and diodes are positioned with room to fit the heatsinks. This version runs the network switch quite well. The heatsinks do get warm, we’ll see how it performs outside on a hot day.